Every one of us living today in the deepest center of our being have what is figuratively referred to as our heart. Our heart is made up of beliefs we have about ourselves and about our lives. We formed these beliefs over time by the thoughts we have thought and from our actual experiences in living. No-one is born with certain beliefs, nor is your heart some magical information center that already fully comprehends life’s mysteries. The heart knows what the heart knows because of what the heart has been taught. So, step one in finally getting somewhere is to dispel the utterly false notion that your heart is what it is already and cannot be changed for all those reasons mentioned above. Changing those beliefs in your heart is not only possible, but required to live that life you keep imagining. However, changing your inner heart is not some overnight affair. It requires time and patience and a faithful, very faithful effort to change your thinking from the lies, or if your prefer, the errors you have accepted as true, over to what is actually true. Could there be anything more sad than doggedly clinging to some wrong belief about yourself, leading to wrong results for yourself, because you are so damn determined that you already know for yourself? As a man thinks in his heart, so is he. In other words, who you believe you are and what you believe you can get and where you think your life will go, is exactly who you are, what you get and where you end up. Your inner beliefs, your core beliefs, good or dreadfully bad determine your life; your life, not someone else’s life! You cannot, absolutely cannot, determine someone else’s life, no matter how much you may have loved them! So, with that, if the year 2016 sucked for you, it is no-one else’s fault but your own. Now, don’t get mad at me for saying that, unless getting mad helps you to maybe reconsider things. The system of believing and how your own personal believing from your heart determines your life isn’t something I made up. The designer of the system is God and because it’s from God it is perfect. It is your all-loving Heavenly Father’s solution for your every problem and heartache and your God-given control over your life. Don’t fight the system with your preconceived ideas, but instead learn the system and tap into the awesome power waiting for you to ‘get it!’ Ideas such as “Let’s see what 2017 has in store for me,” falsely assigns control over your life to someone or something else. The new year, God, or the devil himself do not decide what is in store for you, you do! You, my friend have the privilege to decide or to not decide and in not deciding fall prey to whatever comes along, which usually isn’t anything good. Not deciding, not learning how and what to believe, clutching to superstitious myths called luck or good fortune, lead only to writing out those same futile wishes year after year, with no changes, no results, no happiness. I should add that our sweet, benevolent Heavenly Father has many wonderful things in store for you, but cannot give them to you without your cooperation, no matter how many times you pray about it. But, if you can believe, something good will happen for you! But that is a mighty big IF! The Bible teaches us to “guard our hearts with all diligence, because out of it (our heart) come all the issues of our life (See, I told you I didn’t make this up). The way you guard your heart is by controlling what enters into your heart. What is in your heart? What are you thinking about and saying the most? Look no further than that. Out of the abundance of the heart, the mouth speaks. What has your mouth been speaking? What utterances are you making to the people around you and even more importantly to yourself? Nobody, or maybe almost nobody, knows yourself more than you do. Sure, you can say you’re going to be rich in 2017, but is that what you really think? Really? Not getting what you want isn’t life’s fault. Life may throw you some curves, or more accurately if we are going to speak in figures, death will throw you some curves, lay out some clever obstacles, manipulate your weaknesses, but can only defeat you when you accept and therefore believe something that isn’t true. Now, you may say, I do believe but nothing ever seems to happen. Well the simple answer is, no you didn’t believe or something would have happened! It’s not rocket science! If you “believed” there was $100,000 buried in the backyard, no-one could pry that shovel out of your hand! But, studying treasure maps, surveying the land and spending endless hours in consideration won’t lead to anything until you finally decide to dig! The first shovel motion into the ground is believing with a determination to keep digging until you find “it” with “it” being whatever it is you’re after! When you finally get around to believing from your heart, whatever it is you were after will always already be there. How? Because the System Designer knew beforehand that you would get around to believing and placed it there ahead of time. It’s not a miracle, it’s exquisite timing and extremely, breathtakingly, intelligent planning. Don’t get swept away by the work harder, attempt more, discipline yourself more crowd. You’ve been there before haven’t you? Yet here you are writing the same stuff down year after year. Your real hard work; your very persistent effort; your true discipline is in controlling that unruly beast called your mind by thinking and eventually believing for the things you want to happen rather than fearfully believing for bad things not to happen. You ever played a sport and tried not to lose? Once you start taming that thinking machine which includes refusing to entertain those loony tunes, catastrophic, fear based potential outcomes, you can begin controlling the things that come out of your mouth. Say what you want and for the love of God, stop saying everything you don’t want! Stop complaining, whining and playing the victim. You are not a victim though you may have been victimized by your ignorance concerning the system. Say things with conviction, with passion, with balls out brazen belief! When they tell you to accept reality or to be realistic, sneak a peek at their New year’s resolutions and see if they also aren’t writing the same tired crap year after year. My heart for you in 2017 is that you learn how to believe. You won’t be perfect at it, unless your name is Jesus, but you will prove to yourself the simple maxim, that your life always was and always will be a composite sketch of your ever evolving thoughts and beliefs. Don’t wait to see what life has in store for you. Walk into the damn storehouse and get all the stuff God already gave you! It doesn’t take brilliance to do so, it just takes a little bold believing from your heart. 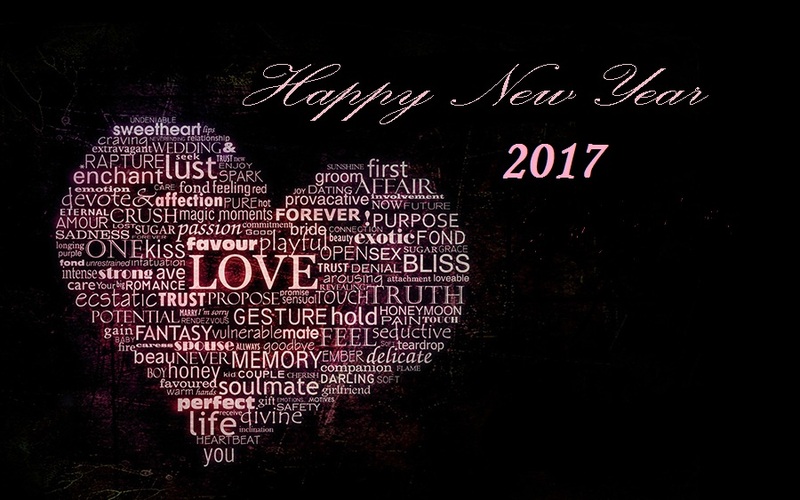 Happy New Year and a Happy New Heart!